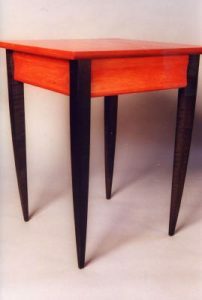 This “Studio Style” occasional table, which can be used as an end table or right stand, is one that Gregory crafted and sold in high end galleries for years. As part of our Woodworking Fundamentals series, this class will solidify the basics of practical woodworking, such as Jointer, Planer, and Tablesaw use. We’ll also use the band saw to create the compound curve legs, and the router table to ease the edges on the aprons. We’ll do some handheld routing on the table top to profile the edge, and we’ll also use a unique technique to cut the mild cove that is on each apron. Assembly and finishing will be covered in class, but completed at the student’s own workshop. Tables will be crafted of American cherry. This class is limited to only 6 students, so you’ll receive lots of instruction & personal attention ! Skill Level: Novice and Up!